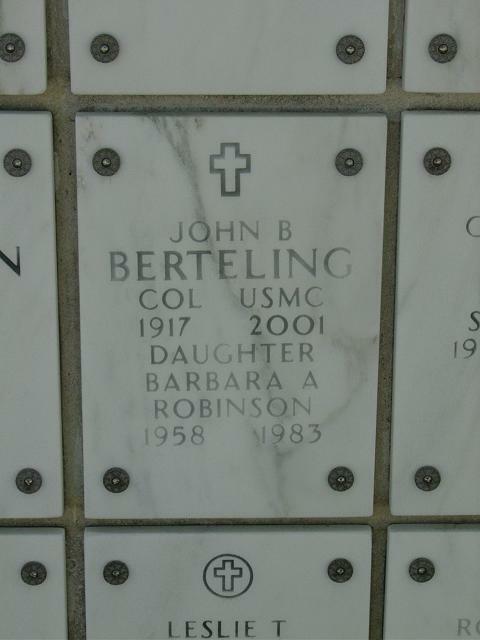 John Burke "Jack" Berteling, Colonel, United States Marine Corpr (Ret. ), Age 83, died on February 15, 2001, of pneumonia at Bethesda Naval Hospital. He entered the service in 1941, graduated from Flight Training in February 1942 and went overseas in April 1942. He served in Samoas and flew fighters at Guadalcanal. He also participated in the campaigns at Iwo Jima and Okinawa. He was Assistant Naval Attache for Air to the Republic of China Taiwan from 1950 to 1952, and commanded a Marine squadron aboard a Navy carrier during the Korean War. Later tours of duty were with the Chief of Naval Operations in the Pentagon, and in the 2nd Marine Air Wing where he commanded a jet squadron. He was the Marine member of the Joint Chiefs of Staff Liaison Group to the Director of Strategic Target Planning at Offut, Air Force Base, Nebraska, and had touurs of duty in Japan and Quantico. He retired in 1967. Notre Dame with a BS in Chemical Engineering in 1938. In 1967 he received his MBA from George Washington University. He is survived by Polly, his wife of 45 years, and his son, John Burke Berteling, II, and his two grandchildren, Sara Kelly and John McCabe Berteling. Burial will be in the Columbarium at Arlington National Cemetery. A memorial service for family and friends will be held Saturday, February 17, at 11 a.m. at St. Bartholomew's Catholic Church, 7212 Blacklock Rd., Bethesda.